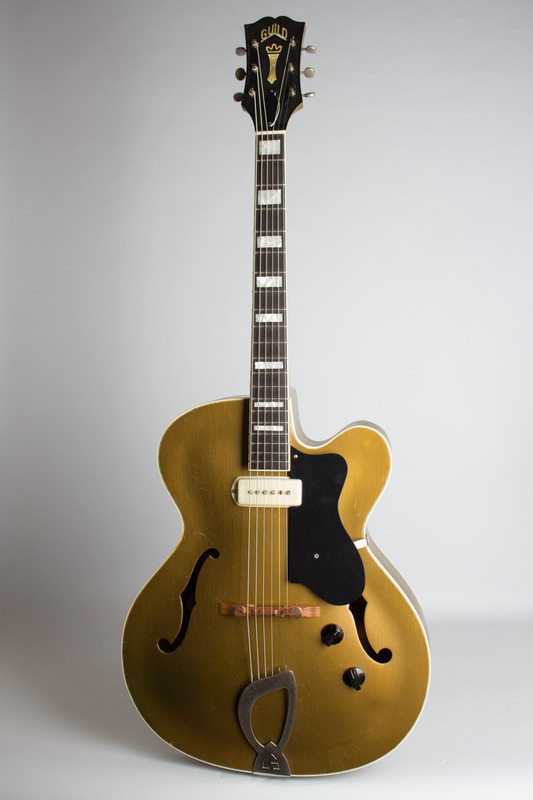 Guild X-150 Gold Model Arch Top Hollow Body Electric Guitar (1958), made in Hoboken, NJ, serial # 6267, gold lacquer finish, laminated maple body, mahogany neck with rosewood fingerboard, brown tolex hard shell case. It's a Guild -- and it's Gold! It's a Gold Guild. That's just something one rarely gets to say. 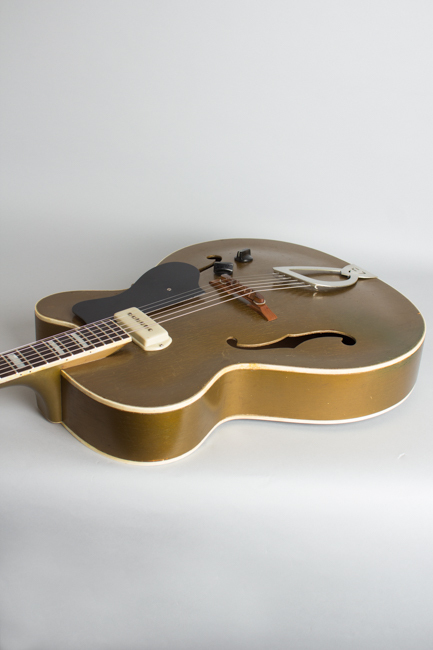 This 1958 Guild X-150 is resplendent in an optional but rarely seen overall "Sparkling Gold" lacquer finish that was offered for a brief time in the mid/late 1950s. This flashy livery was obviously intended to compete with Gibson's all-gold ES-295, but it seems Guild's customers were rarely tempted and hardly any were ever ordered. 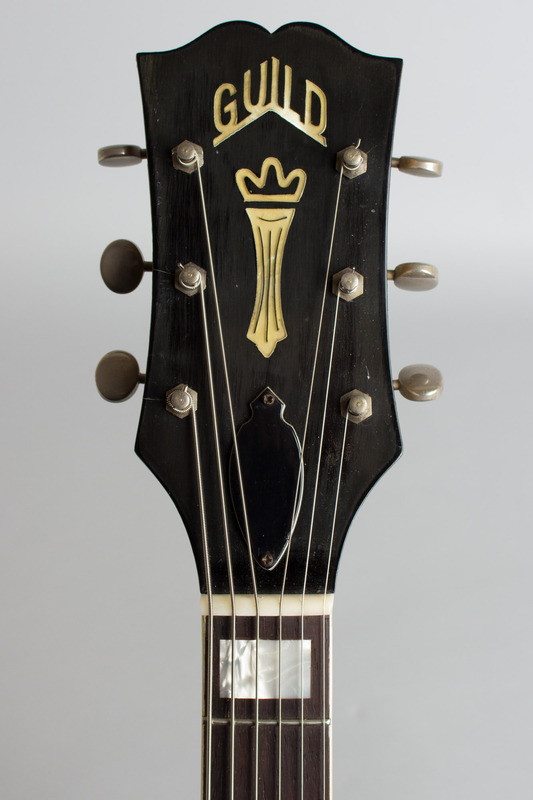 The old-style Guild label even notes "Gold" under the serial number, just to confirm its provenance. 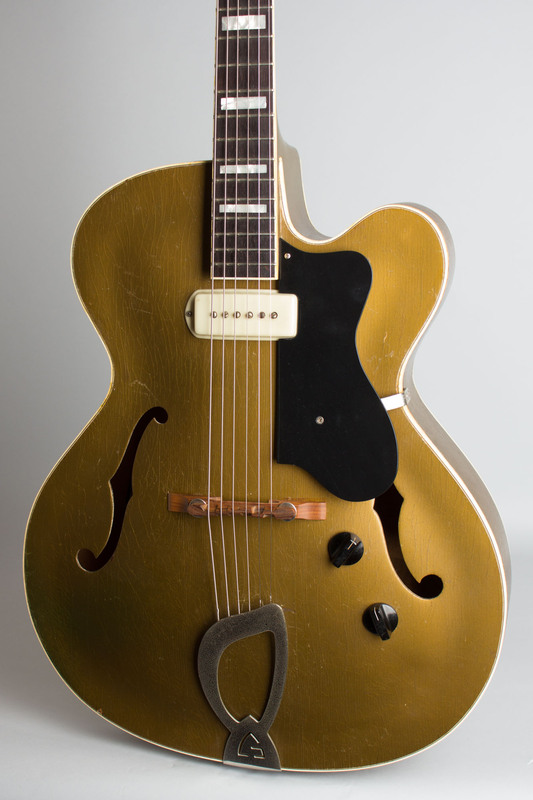 The X-150 (which came more commonly in sunburst or natural finish) was generally Guild's answer to Gibson's very popular ES-175, intended as a working man's arch-top electric with a cutaway. The X-150 is a somewhat larger guitar than the 175 with a 17" lower bout, but is similar in many other respects. It traces its ancestry back to the earlier Epiphone Zephyr Regent, as many of Guild's early employees were refugees from the closed New York Epiphone factory. Like most early Guilds, the X-150 is a fairly conventional and conservative design for its time, which makes this all-gold example all the more striking. 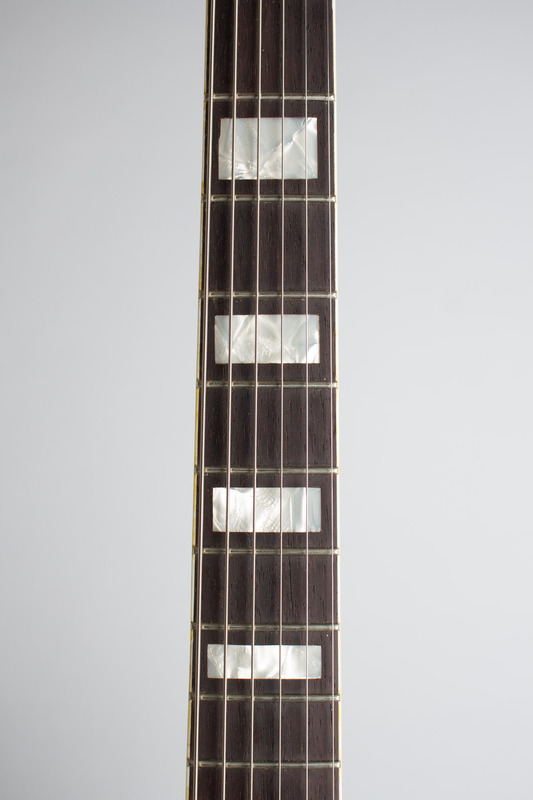 The guitar's other features include a single P-90 style pickup under a white plastic cover near the fingerboard, adjustable rosewood bridge and Guild harp tailpiece, a bound block-inlaid rosewood fingerboard and plastic-faced headstock fitted with openback, and metal button Waverly tuners. 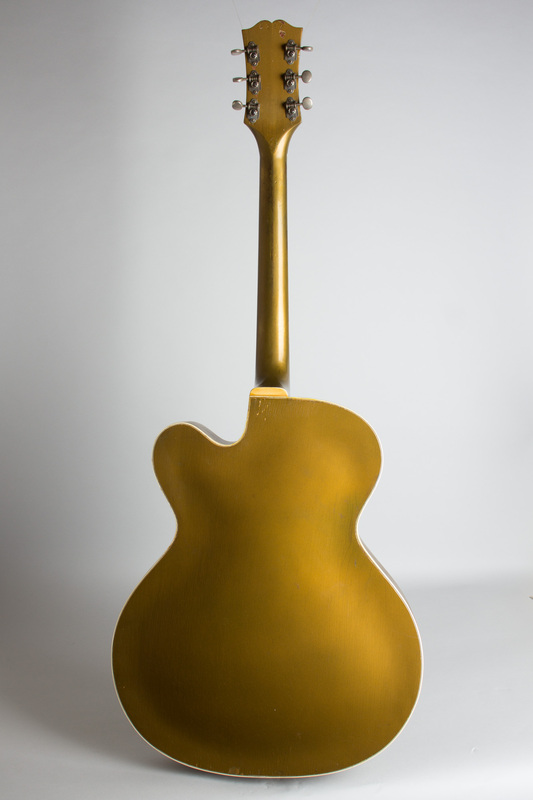 The gold-lacquered body is triple-bound top and back. This is a pretty unique guitar, with a much flashier look than most period Guild instruments and vibe for days! Overall length is 42 in. (106.7 cm. ), 17 in. (43.2 cm.) wide at lower bout, and 3 1/8 in. (7.9 cm.) in depth, measured at side of rim. Scale length is 24 1/2 in. (622 mm.). Width of nut is 1 5/8 in. (41 mm.). This guitar has had a decent amount of restoration but remains an excellent playing and sounding instrument. 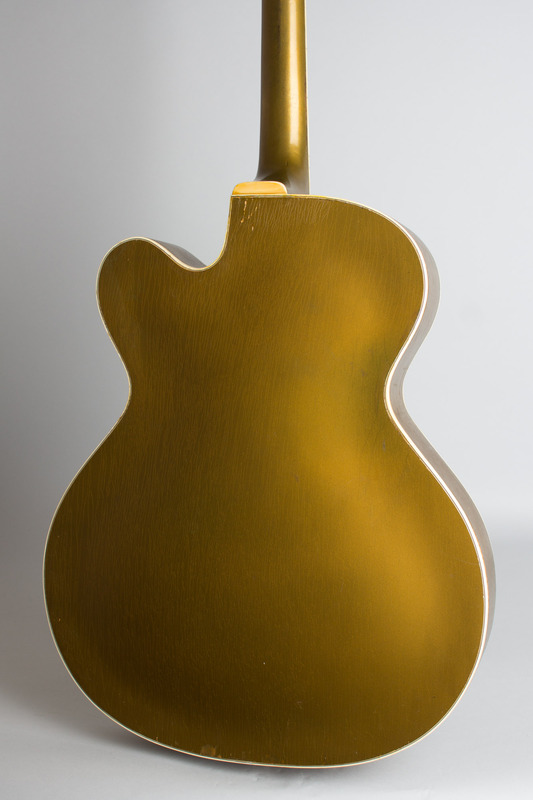 The finish on the back of the neck has been resprayed; just as with its Gibson equivalent, the original gold lacquer likely greened and chipped away from contact with the players hands. The match is not exact, but it looks good and feels fine. 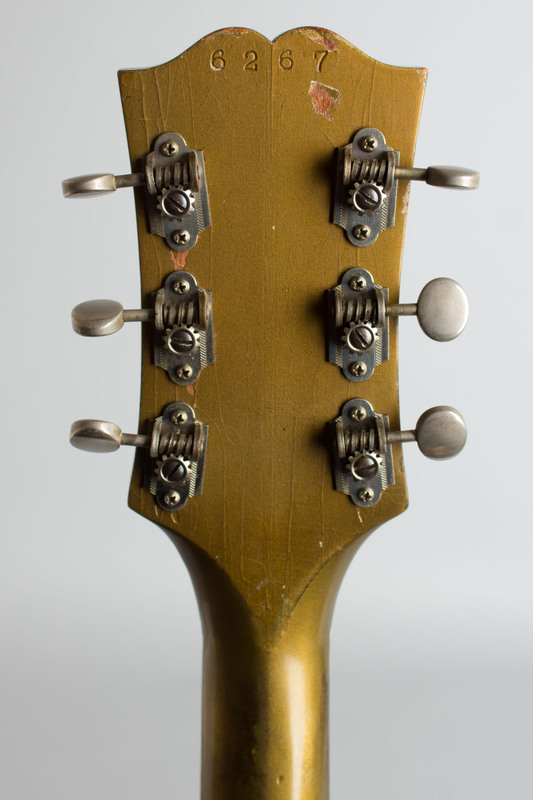 The gold finish on the body and back of the headstock remain original. The original gold lacquer has darkened and checked, but is mostly intact with some chipping away on the bottom edge. The guitar has been expertly refretted and the fingerboard has been rebound; the body binding is original, with some shrinking but no deterioration. The pickup a modern Lollar P-90 under the original cover and the wiring rig is also new. The original pickup is included; it has a relatively weak output and is quite noisy in operation, but could be restored to the guitar if desired. The tuners, tailpiece, and knobs are original while the pickguard is a reproduction, and the bridge is a correct Guild piece but more recent than the guitar. The guitar plays and sounds excellent; the Franz pickup has its own distinct charm and gets snarly when pushed, but doesn't overload the way a typical P-90 will. This is a very unusual and cool period Guild, with a particular 1950's charm. Includes a more recent HSC. Very Good + Condition.